Remove and discard the leaves and pink base from rhubarb and cut sticks into 2 cms pieces and weigh. Place rhubarb in a large bowl with the juice and grated zest of 2 lemons. Peel and bruise the ginger and tie in muslin cloth with any lemon pips and add to bowl. Add sugar, stir and leave for at least 2 hours or preferably overnight. 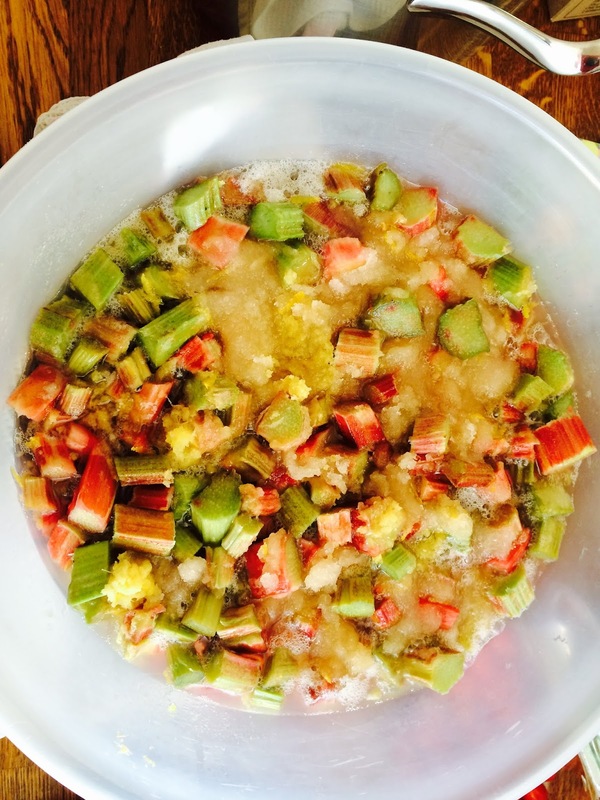 Put rhubarb mixture in a large preserving pan - but do not use aluminium - and heat gently, stirring until the sugar has dissolved. 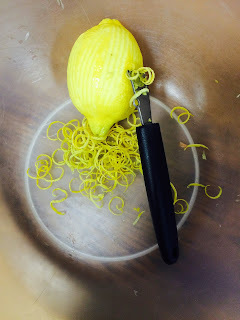 Remove the muslin bag containing the bruised ginger and lemon pips and discard. Stir in the chopped crystallised ginger and bring to a rapid boil without stirring and then continue to boil for app 15 minutes. Remove any scum as it rises to the surface. Test the jam for setting by putting a teaspoonful of jam on a coild dry plate. If it forms a skin or wrinkles when a finger is drawn across, it has reached setting point. If it does not set, boil for a further 5 minutes and test again. When a set is obtained leave to cool for a few minutes then pour into sterilised jars and seal whilst still hot. The following day,if it appears not to have set sufficiently, you could try boiling it up again and then put back in the jars (having washed and sterilised them again). 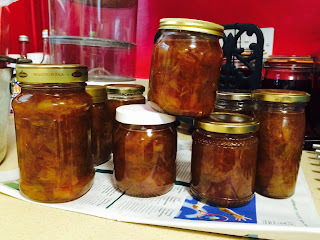 If it doesn't set,don't worry - just call it rhubarb preserve - it will taste just as good - and serve it on toast for breakfast or afternoon tea.